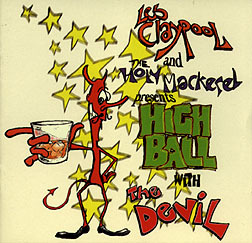 CD Review: Les Claypool and the Holy Mackerel, "Highball with the Devil"
Well, I'm not exactly sure what to say about this disc. I mean, it leaves a lot to interpretation and to the imagination, and I as I sit here as frustrated as a uni-lingual translator at a U.N. party, I can only think, then, that this is a good record. It's open to everybody's different perceptions. I think the best thing to do is listen to it in the wee hours of the morning (3 or 4 am), light up some candles or just sit in the dark, motionless, with your eyes closed (the partaking of some of B.C. 's finest natural resource is optional... but recommended if it's your thing) and just let the words and sounds envelop all of your senses. Upon doing this, I heard some interesting sounds. I sat and watched a bright light shine in from the window and suddenly Tom Waits appeared with a green Martini, shouting obscenities at the members of Les Rita Mitsouko as they did some kind of flamenco dance around William S. Burroughs, who was smoking a blue cigar and spouting the evil doings of Dr. Benway. Then Les Claypool came in with a glowing silver bass and played some chunky Primus riff and then took on the role of the Great Mediator, bringing all these outside forces under wraps, attempting to obtain a sense of cohesion. As soon as he entered, though, he disappeared and again things wandered off to the land of interpretation, and as Dwight Yoakam sold cowboy hats to the Beatles in front of the small-town courthouse, I feared I must leave before Huggy Bear and George Clinton tried to convince me to go down to Texas with Eddie Munster, my purple dreadlocks waving in the wind, and have a Gin Ricky with Satan himself. It's funky, it's Les Claypool, it's different and I LIKE IT!